it’s almost here! that’s right nerds, Battlestar Galactica (BSG) premieres on Friday! both seanalyn and i are preparing ourselves for this epic event! i am hosting a BSG party at my apartment and inviting lots of hungry guests. seanalyn and i will be brainstorming ideas and recipes for our themed party. Allison from seriouseats.com posted this incredible masterpiece with a working cylon laser eye. 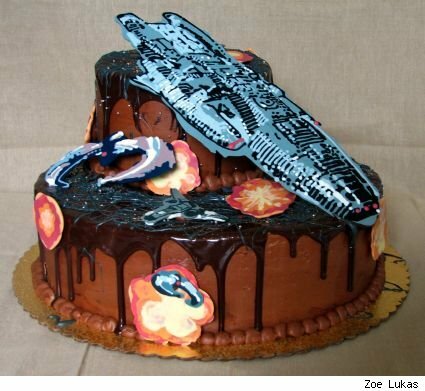 although not edible, this would make for a great centerpiece at our party! too bad i’m not that handy at carving pumpkins! i am thinking of taking those Pillsbury Crossiants, stuffing them with crab & cream cheese, and creating foldovers in the shape of cylon raiders. i’ll give the illusion of their notable ‘laser eye’ with a slice of red pepper. um, we’ll see how this one turns out! Stir and Serve with a touch of ice in a slender Collins glass. Shake and serve in an old fashioned glass. what i loved even more is that there is actually a Battlestar Galactica drinking game with rules and everything! please let us know if you have any creative ideas, thoughts, comments, suggestions, etc. we absolutely love hearing from you!